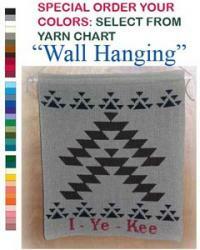 These beautiful drapey Wall Hanging comes with a special meaning. 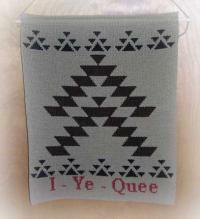 It is symbolic of the "Apron" which is an important part of the Native American Ceremonial Dress. The Artisan, Darlene Marshall remembers when she was a small child, her father told her: "When a girl dances correctly, the sound of shells and abalone make the dress sing." 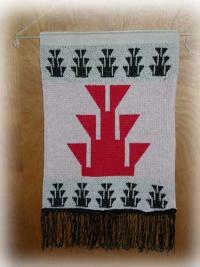 The fringe on the bottom of the hanging represents the "Singing Apron", and sways as the 'Hanging Dances". 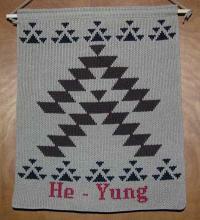 These aprons are usually designed with a large central motif, bordered by smaller motifs. The main color is off white or tan. 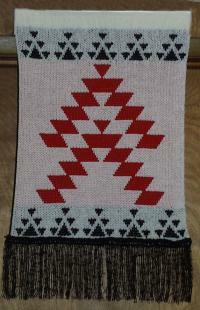 The motifs are in colors that could be obtained from the plants in the area of the Reservation. To match home decor, we do give you the option to select your own colors. 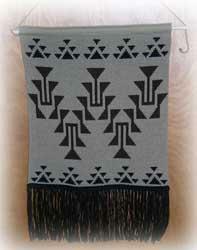 These wall hangings will be a great decor item in any home as a gift ! !